Construction projects don’t always lend themselves to awe-inspiring Instagram pictures, so getting the most out of social media takes some planning. With a well-organized social media content calendar, you’ll always have something to post that rewards your effort. Before you plan your approach to social media, decide exactly what you’re trying to do with it. Your goals influence both what you post and how often. Is your main objective to increase brand awareness, improve your reach or bring in leads? For example, daily posts about a home remodeling social media challenge you’re running are likely to help more with brand awareness than with lead generation. 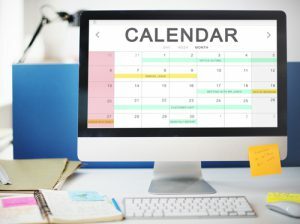 No single posting schedule is right for every company and every platform, so spend some time researching the schedule that best suits your goals. If you want to attract warehouse construction leads from Facebook, it’s enough to publish a few weekly or even monthly high-value posts, such as data-backed tips on managing cold-storage construction costs. If your goal is brand awareness, you might share lighter content, such as striking before-and-after pictures, as often as twice every weekday. Consistency is critical, so choose a schedule you can stick with. Include time for interacting with people in your target audience by sharing, commenting on, and “liking” their posts. When you’ve settled on a posting schedule for each platform, decide what type of content you want in each time slot: text, images, links, and/or videos. For efficiency’s sake, aim to plan at least a month out. If you’re trying to generate leads, you might use a case study as a lead magnet and promote it on social media using interesting facts, helpful tips, and eye-catching photos from that case study to encourage potential clients to download it. If you specialize in home additions and want more brand awareness among growing families, you might plan a series of funny or emotional videos aimed at getting shares within that audience.